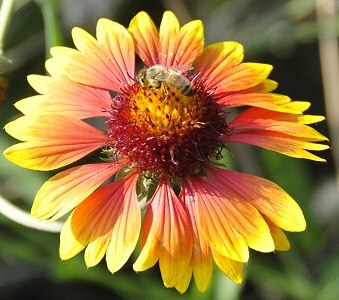 This Gaillardia descendent is from the humble wild flower known as Blanket Flower. Like its wild ancestor, Dazzler provides almost non-stop color and is extremely easy to grow. Gaillardias are one of the first plants to start blooming and one of the last plants to stop. They often self-sow and sometimes present us with variations in color. They are important beneficial insect and butterfly plants. 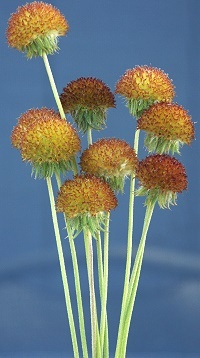 We also like the way the Gaillardia cones look after the flower petals have fallen off. These are especially nice for crafting fresh herb wreaths. Cut the stems nice and long while the cones are still soft. They will blend nicely with other fresh herbs and add an interesting detail to the wreath. They can also be dried and used for other crafts. Since Gaillardias bloom so profusely, and since so much plant material is needed to make a fresh wreath, this is a nice extra to have in the garden. For more on making fresh herbal wreaths, be sure to read Wreathmaking 1.2.3. 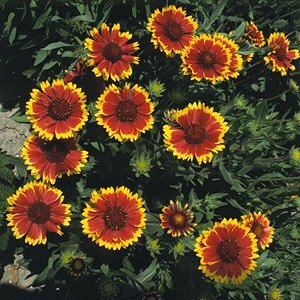 Gaillardia makes a great addition to our Crafter's Herb Garden Six Pack. Though not English in origin, Blanket Flower has a Cottage Garden look and makes a perfect addition to our English Cottage Herb Garden Six Pack.